Ok, iNitsua Portrait is a pretty sweet iNav inspired theme. There is also a landscape version of the theme but, I’m going to be concentrating on the portrait version. I’m not going to tell you how long it took me to set this theme up but I’m hoping my guide below will help you set it up in much, much, much less time than it took me! The guide below looks a little long and probably a bit crazy but, it is because I walked through every step. MySMS is an SMS application that can be used in the place of the stock SMS app (or in conjunction with it). When you first open MySMS, you will get a pop-up saying that you are using an unregistered version of the application. You can register the application for $4.95 or $24.95. You can see what the registered versions offer by selecting Register. Once you are in the application, you will be on the main screen. 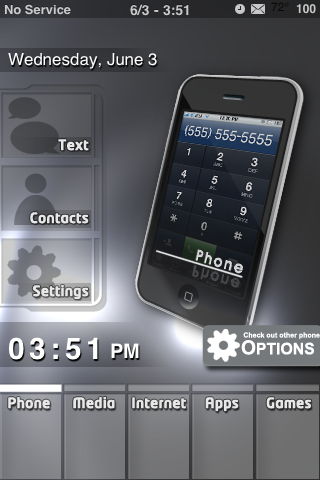 On the main screen, you will see a list of all your SMS conversations. The most recent conversation being at the top of the list. You can change the list view by using the arrow icons on the lower menu bar. The first icon with the double arrows will show the individual text messages that you have both sent and received (instead of showing the conversations). The down arrow will display all the individual text messages that you have received and the up arrow will display all of the individual text messages you have sent. The last icon on the lower menu bard, the two chat bubbles, will bring you back to the conversation style list of your text messages.